Beginning in fall 2018, students in the University of Redlands College of Arts and Sciences will be able to enroll in a new multidisciplinary major, Health, Medicine, and Society. James Krueger, philosophy professor and director of the program, chatted with Mika Elizabeth Ono and Katie Olson of U of R’s Bulldog Blog about what distinguishes the major from pre-med studies, how it can satisfy a range of student interests, and the need for a broad-based approach to the field of medicine. Bulldog Blog: How did the Health, Medicine, and Society program come to be? James Krueger: A number of faculty members have been talking for some time about putting together an interdisciplinary program related to medicine. About three years ago, a group of us—including Lisa Olson in biology; Celine Ko Roberson in psychology; Greg Thorson, who teaches some health policy; Vicky Lewis, who does work on disability issues; and a number of other history, media studies, and sociology faculty—started thinking seriously about what we could accomplish. Before the Health, Medicine, and Society program, we didn’t have a way to integrate the offerings of various faculty interested in medicine in a way that was visible to students. Now, when we describe the major to students, we often see reactions like, “This is what I'm trying to do, and I didn’t see how to do it!” We already have students in the pipeline for the major, and incoming freshman are definitely set to get started. We’re excited! BB: The program’s website says that Health, Medicine, and Society students can go on to become medical professionals. Can it serve as a pre-med program? JK: Definitely. Of course, students would need to go on to graduate training, but if they're interested in medical school, they can take many of the prerequisites through this program. One advantage is the program frees up a lot of space in students’ curriculum, which students can use to pursue a second major. Traditionally, pre-med students major in biology. But medical schools already have enough biology majors. They're actually looking for students who have different sorts of perspectives and training. Medical schools want both breadth, which the Health, Medicine, and Society program provides, and demonstrated mastery in a field, which can be accomplished with a second major. Come graduation, students can be in a great position to go on to medical school. The major will also serve students who want to go into healthcare administration, public health, and other health-related professions—it is designed to be very flexible. BB: Can you tell us about the coursework? JK: The spine of the major is the HSM 100 course; this semester will be the third time I've taught it. The assignments in this introductory course are geared toward getting students to think broadly about health and medicine and to start writing about their own interests—what they hope to accomplish, what questions interest them, and what coursework would be relevant. As part of the major, students will take a statistical methods course to help them understand basics of medical research. In their junior year, they will revisit what they wrote their first year and see if it still reflects their interests. They’ll also start setting up an internship or service project. Beginning the end of their junior year and continuing into senior year, they'll immerse themselves in a capstone sequence. BB: The name of the major—Health, Medicine, and Society—is broad. What subjects are in the curriculum? JK: One topic is natural science—classes in biology, chemistry, and physiology. The second is medical humanities, which can include bioethics, history of medicine, philosophy of medicine, English, and women, gender, and sexuality courses. The third is policy and management courses, which allow students to analyze healthcare policy and prepare students for roles such as managing a group practice or public health office. The fourth is person and society, which focuses on medical anthropology, sociology, and psychology. Finally, there is global health, concentrating on health issues at the global level. BB: Why is it important to examine health and medicine through a liberal arts lens? JK: In this program, students can explore broad questions. What does it mean to be sick? How do we understand that? How we define it conceptually? Biochemically? Socially? What are the issues there? How do we address health concerns across borders? In addition, students will look at medical research, how it works, and what kinds of inferences we can legitimately draw from different kinds of studies. 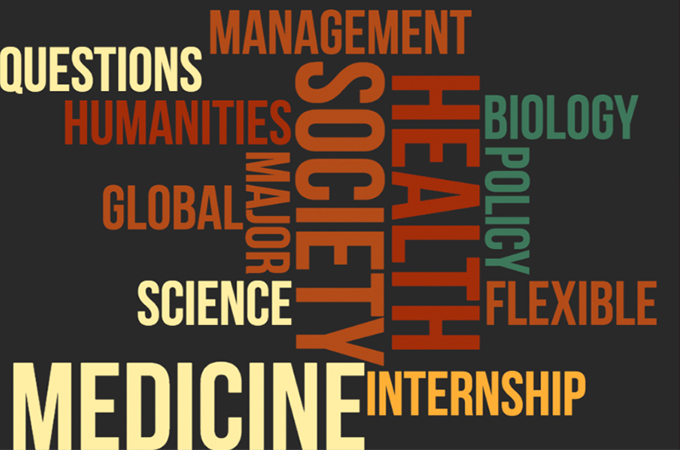 There's a growing movement to bring medical humanities into undergraduate education. From my point of view, medical students need to gain an understanding of the humanities before they get to medical school; if students want to read authors like Dostoyevsky and respond to it in medical humanities courses, there is more space for that as an undergraduate. We’ve got to open future physicians and other medical professionals up to thinking broadly about medicine and health before they get to medical or graduate school. For more information, see the Health, Medicine, and Society program web page.